ESL employers have all kinds of preferences for teachers and a lot of them can be discriminatory. Over the years that I have looked at the job boards in Asia I have encountered many schools that have posted their preferences for a female teacher. I have seen these in China, Korea, Taiwan, Japan and elsewhere. I wanted to share this so I did a little search using the keywords "female English teacher wanted" and "female English teacher preferred" and here are just a few results from the first page. "Native English teacher (female preferred)" - Vietnam, Quy Nhon"
"English Teacher in Japan (female preferred) - Craigslist"
"Female English Teacher needed in Kindergarten - Aichi, Nagoya, Japan"
"Morning Female English teacher wanted for corporate classes (Tokyo)"
"Female English teacher wanted for university in Suzhou"
"Professional Corporate Female Foreign Teacher Wanted!" "Looking for female full time English teaching position/Busan"
"Looking for female teacher in Korea/Full time/Stable school/Busan"
"Looking for a female native English teacher (teaching on skype)"
"We want you! 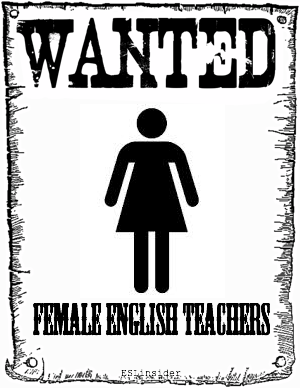 Female English Teachers urgently!!! - Jobs in Hangzhou"
"Female English teacher needed in Nanjing, 6000-8000 per month..."
Female teachers who are already teaching abroad are aware of this preference too. Here are a couple posts from Dave's ESL Cafe. "Korea 03/2015: Experienced American Female, Age 27, 120-hour TESOL"
"CELTA certified, 4 years' experience, American, Female EFL teacher for Saudi Arabia"
"Postgraduate certificate of TESOL (Macquarie University) - Female teacher looking for ESL teaching position in China, HK, Vietnam, Thailand, JEJU & BUSAN!" You know employers have all kinds of preferences that can be listed or unlisted. In America people still have preferences that can be discriminatory, but they just don't list them on the job boards. In Asia it's a little different. It's not so politically correct and/or aware of the differences. They just say what they want.